Translation: The study of language has two parts: first, and essential to this study, is langue, that aspect of language which is social in its essence and independent of the individual; this study is only mental; secondarily, there is the individual aspect of language, parole, which includes phonation: this aspect is psycho-mental. It must be noted Saussurean linguistics no longer exists in its original form. 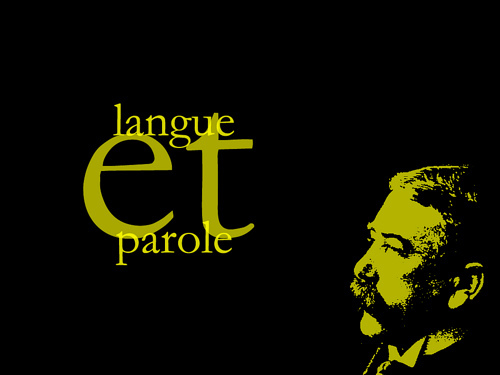 The terms langue and parole are viewed as insufficient and imprecise. 1. It implies that this is not a monolingual blog: the title includes French and English, the primary languages here. 2. It implies that this is a blog generally focused on language and linguistics: the title is not PC or Apple?. 3. It implies a minor linguistics quiz: you have to decide whether blogging falls in the linguistic category of langue or that of parole (and that same question could be applied to each specific blog post). 4. It implies continuing discussion and refinement of ideas: the question mark indicates that I am not always sure about my linguistic observations and therefore invite contributions and corrections.